A two-day meeting was held this week by the Ministry of Marine Resources to discuss an updated national plan of action for sharks. Ministry of Marine Resources (MMR) secretary Ben Ponia organised the consultation to talk about the problem of shark over-fishing and the possibility of creating a shark sanctuary in the Cooks. Ponia flew in Dr Shelley Clarke from Japan, a recognised expert in the shark fin trade and Pacific shark fisheries, to speak on global and regional shark issues. 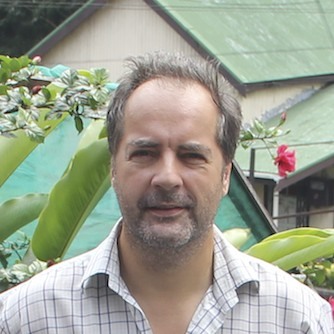 Clarke gave information on global and regional shark data, Cook Islands-specific information such as shark catches in the area, and science and policy suggestions. The meeting was attended by 15 people, including Cook Islands national heritage trust director Gerald McCormack, Te Ipukarea Society (TIS) programme manager Jacqui Evans, a representative from the aronga mana (traditional leaders), and Pacific Islands Conservation Initiative (PICI) founder Stephen Lyon. PICI has been advocating for the creation of a Cook Islands Shark Sanctuary since October of last year, but the meeting was called without any input from them. PICI programme co-ordinator Jess Cramp said they were to be sent a copy of the presentation before the meeting but it never eventuated, so they were ”interested“ in what was going to be discussed. Both Cramp and Lyon were vocal in their advocacy for zero retention of sharks. 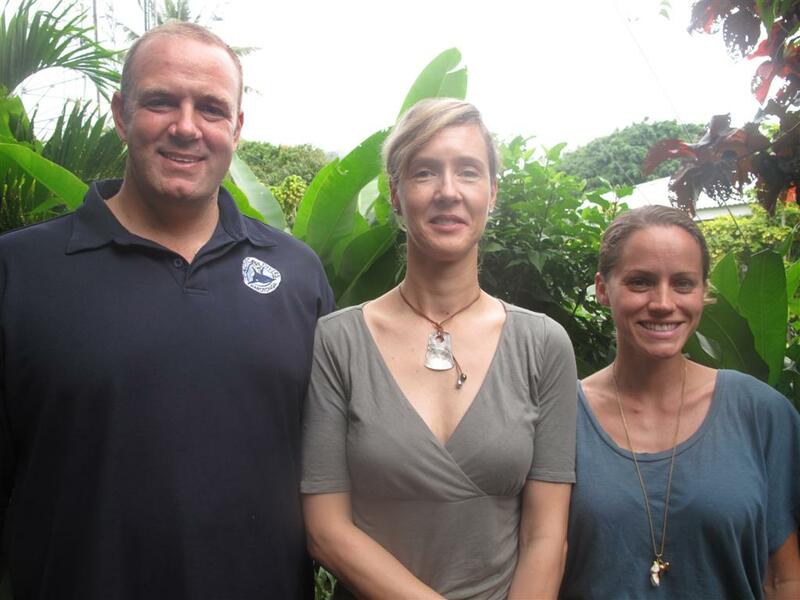 Lyon asked where Clarke thought the Cook Islands stood on a global scale of shark conservation, to which she replied Cook Islands is quite progressive and in the ”leading pack“ in the region’s fisheries management. While she was presenting Western and Central Pacific Fisheries Commission (WCPFC) data, Clarke says the Cook Islands are free to set its own regulations. Clarke estimates that 26 to 73 million sharks are killed each year around the world. This number threatens the sustainability of shark populations. At least 80 species of sharks and rays are found within the Pacific Islands region. Around half of these species are considered to be highly migratory, so fishing impacts upon them must be internationally managed. Due to their low productivity and long life span, these species are vulnerable to overexploitation. Basking, oceanic white tip*, whale and great white sharks are particularly vulnerable to trade, and are on the CITES (Convention on International Trade in Endangered Species) danger list. Shark finning is extremely topical – in Parliament this week Opposition leader Wilkie Rasmussen questioned marine resources minister Teina Bishop over whether vessels licensed under the exploratory programme are finning sharks illegally. Bishop replied that once he has evidence of this to support the claims, he will terminate the licences. On Friday, MMR presented the proposed elements of the updated version of the National Plan of Action for Sharks and invited further discussion. Are we promoting shark fishing? *Note: Oceanic whitetip sharks are note listed by CITES. Wikipedia has the best definition of ‘shark finning’ on the Internet. Shark finning is defined as the cutting off of a shark's fin and discarding the body at sea. Finning is more an issue of animal cruelty and welfare than of conservation, as banning the practice of finning does not mandate catch limits or the number of sharks killed for their fins, or rather, the number of sharks allowed to stay alive in our oceans. The only peer-reviewed scientific study to estimate the number of sharks killed each year is Global estimates of shark catches using trade records from commercial markets by Shelley Clarke, published in Ecology Letters in 2006. Using trade data from several years in the 1990s, she estimated that between 26-73 million sharks are killed each year, with a mean of 38 million. Conservation organizations will simplify this number by saying something like "up to 73 million" or "as many as 73 million" sharks are killed each year. More than 73 million is wrong, as are 100 and 200 million. This number will be updated in the near future, however, as Shark Defenders knows of two independent studies currently underway that are trying to estimate the number of sharks killed each year. The take home message, of course, is that tens of millions of sharks are dying each year and scientists think this is too many. The Shark Conservation Act changed the finning rule of the United States from the 5% rule to fins naturally attached. Under the 5% rule, fins could be removed from sharks at sea as long as the shark bodies were brought to port (the heads and intestines were usually cut off and thrown overboard). At the port, the weight of the fins had to be no less than 5% of weight of the shark bodies, or else the fishermen were in violation of the law. For a number of reasons, this management scheme opened up a number of loopholes. Fins naturally attached attempts to close those loopholes by requiring that sharks must be landed in port whole, with their fins naturally attached to their bodies. The Pew Environment Group explains the US Shark Conservation Act in this Youtube video. The European Union currently uses the 5% rule and is considering switching to fins naturally attached, similar to what the United States, Chile, and Venezuela have done in the last two years. The Shark Alliance explains the shark protections being considered by the EU in this video. Shark Sanctuaries ban the commercial fishing of all shark species in a nation's entire exclusive economic zone. Some countries have created smaller reserves for shark species, such as Los Roques in Venezuela, but these are not the all encompassing protections of a full shark sanctuary. Discovery News reports on the 2011 creation of shark sanctuaries in Honduras and The Bahamas and how they protect sharks. Again, as we like to say, the shark conservation movement requires educated, dedicated individuals to create informed campaigns to develop policy to protect sharks. We hope that you take the time to learn about the different mechanisms available because it will help you better advocate for the protection of sharks. 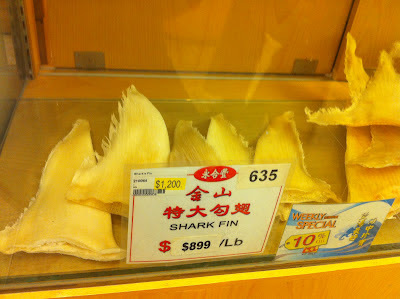 How is the sale of shark fins as ‘incidental catch’ similar to cattle grazing on common grounds? The debate between opposing parties to the suggestion that Fiji should have a total ban on the catch and sale of sharks (or just parts of sharks such as their fins), took on a different angle whereby the fishing industry consortium (the minority but powerful lobby group in the room) argued that they were not interested in catching sharks and totally accepted that sharks needed to be protected. In other words the fishing consortium seemed to be ‘on side’, consultative and reasonable to the larger group of stakeholders who were arguing for a total ban on shark fishing and/or the sale of any shark products. The fishing lobby’s suggestion was for Fiji to set up sanctuaries particularly around the coastal areas throughout Fiji waters. Their argument was that the majority of the species were found around coasts and coral reefs associated with the coasts, and that they were not concerned with catching sharks anyway (which were, according to them, few) and that they released any live sharks that they accidentally caught on their long lines. Why did and should the conservation group be so adamantly against this apparently reasonable gesture by the fishing lobby group? The answer lies in that it creates loopholes and loopholes are always exploited by people to their own gains. Is this true however? Psychologists, economists, mathematicians and biologists have answered this question and it started with an unusual consideration of owners of cattle who wanted to graze their livestock on common land. Garrett Hardin revived a report that was first written up in 1833 by an amateur mathematician who outlined a scenario which has subsequently been titled the “Tragedy of the Commons”. A ‘Common’ was a common piece of ground used for agricultural or pastoral activities. Rather than being owned by someone or a group (such as a family), the Common was for everyone to use. A Common was still regulated because it was realised that if everyone wantonly used up the resources of the Common, then it would cease to be of any value. An agreement between all the cattle owners could prevent this problem if everyone agrees to only have a set number of cattle (say five each). Of course not every cow is the same so some cows might eat a bit more than another cow. For this reason the actual number of cows per grazer should be slightly less than the maximum permitted to account for this discrepancy – to act as a buffer as it were. If everyone was to have more than this (say six), the results would be that the buffer would be used up and the Common would be overgrazed – the result would be overgrazing and everyone loses. Such Commons really do exist and for the many, the system works well. However, on some Commons people might have a tendency to ‘sneak’ a sixth cattle onto the Common. If one or two cattle owners do this, it probably won’t affect the Common too much because of the built in buffer. They get ‘free’ grazing for an additional head of cattle. However, sharp sighted peers would think “well why should I ‘lose out’ to others? - I’ll sneak a sixth cattle onto the common too!”. Of course what happens in the end is that everyone ends up putting more than their allocated five cattle per owner, and the result is that the buffer is exceeded the Common would be overgrazed and then no cattle can use the Common at all – everyone loses medium to long term including the ‘cheats’. This is the ‘tragedy’ of the situation. The ‘buffer’ is a loophole that can be exploited. This has been experimentally researched in a ‘game’ that can be played called the ‘Prisoners Dilemma’. The science behind this is both psychology and mathematics in a discipline called ‘Game Theory’. If you’ve seen the film ‘Beautiful Mind’ with Russell Crowe as the mathematical genius John Nash, then this is essentially ‘Game Theory’. Research participants ‘play’ a theoretical game in pairs. The rules of the game are that: they may gain a short term individually large reward if they ‘cheat’ on their playing partner; they lose if they are cheated on (or they don’t gain as much); or they and their partner gain a small amount but over the medium to long term this adds up to be far larger overall; and finally they both lose a far larger amount if both partners try to cheat on each other. These are not unlike the conditions described in the ‘Tragedy of the Commons’. So what actually happens in this research? It depends on a number of factors, such as the size of a short term reward, the apparent loss if others ‘cheat’ the system (related to the size of the short term reward), as well as the size of penalty to both parties if they both try to cheat on each other, and the size of the mutual gain to work cooperatively as well as the time frame in which the mutually cooperative work is rewarded. It should be mentioned that many variations to this game have been played including the more realistic versions where there are more than two players and where the game can be played more than once, i.e. many fishing boats, or more than one fishing fleet and each time the fishing boat goes out, it is the equivalent of playing a game. The proposal to have a set of shark sanctuaries in Fiji waters is almost impossible to police (when are you actually ‘in’ the shark sanctuary and when are you ‘out’?) with today’s technologies and limited government resources. The current system is also open to abuse in terms of defining when a shark is currently ‘dead’ on the line without qualified independent observers on board the fishing fleets. The proposal to set up a set of partial sanctuaries for sharks in Fiji waters, and the allowance of accidental or ‘by-catch’ sharks by fishermen outside of these sanctuaries, is a situation that is a classic ‘Prisoners Dilemma’ game. 1. The pressure to ‘cheat’ is enormous with the current value of a shark fin being about six times the price per kilogram of tuna. 2. The penalty of not cheating is relatively large when some fishing fleets are going out to fish and coming back with a negligible catch. They still have to pay wages, and fleet operating costs. Those costs can be recouped (even partially) if ‘by-catch’ sharks (actually their fins) are sold. 3. The penalty for over fishing of sharks because almost everyone ‘cheats’, is the collapse of the eco-system including the tuna populations resulting in the collapse of any associated tuna industry. 4. The time frame for such a penalty is counted in years, not days, weeks or even months. If the short term windfall from cheating is measured in years, this is enough for individuals (fleet operator owners) to get very rich before the whole system collapses. The result will be that fishermen will definitely cheat. Not all, but as time goes on, more and more will fisherman will cheat until the eco-system collapses. The cheating will be something along the lines of a very loose interpretation of when a fishing boat, or even a fishing line is within the sanctuary waters; and a very liberal interpretation of when a shark is considered ‘dead’ on the line. Indeed, those that don’t ‘cheat’ will go out of business before the whole industry collapses, and it’s always hard to maintain ethics when food is not coming onto the table! Could this really happen, as surely if we know the science of the dangers of overfishing the whole industry would not go down this route? Sadly, we have more than enough recent and ongoing examples of fishing industries that have or continue to be overfished and the industry has is in imminent danger of collapsing. So the short answer is yes it can definitely still happen. The most spectacular is probably the North west Atlantic cod by North American fleets and the similar case in the North east Atlantic particularly Scandinavia, Britain and Iceland. The issue therefore is not that the industry is unaware of the problem. The issue is that whilst there is an appreciable gain to be made out of ‘cheating’ before the industry collapses, the temptation and the psychological pressure will overcome any scientific wisdom or logic. This is what the Prisoners Dilemma research has demonstrated and results in yet another ‘Tragedy of the Commons’. How can this be reversed? After all there are successful ‘Commons’ in real life that do not always end in a tragedy. Again the research is clear on this, the ‘rules’ of the game must be played with different loses and gains for either ‘cheating’ or ‘cooperating’. 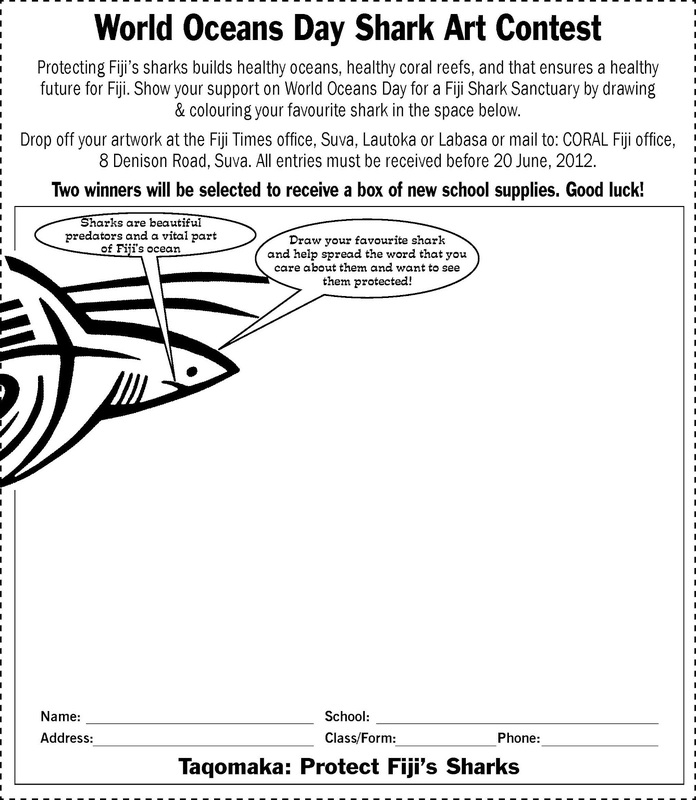 The potential short term gains might be minimised (unfortunately it is not easy for a country like Fiji to dictate the market price of shark fins); the penalty for ‘cheating’ must be far larger than the short term ‘gain’; the penalty for cheating must be almost immediate (days or weeks, not months or years); the conditions under which behaviour is defined as ‘cheating’ or ‘cooperating’ must be immediately apparent. • The easiest way to make cheating and cooperating apparent is to have a total ban on all shark fishing throughout all of the Fiji’s waters. A total ban is the only solution that is possible without significant advances in the implementation of reliable and cheap technology that can instantly and always identify when a boat or associated fishing line is in a ‘mini’ defined sanctuary or not within Fiji’s waters. • Accidental by-catch can be minimised by the use of appropriate materials (‘shark friendly’ hooks) and fishing behaviour (laying out of fishing lines and nets at times when sharks do not hunt). • No shark product to be sold even if the shark is actually dead (some by-catch is inevitable) so there is no temptation to ‘liberally’ interpret when a shark is dead on the line (or not). • Transgressions of these measures when detected, are always punished as a penalty for cheating. • Penalties are so severe that it overrides any short term gains by fishing boats or fishing fleets that think they can get away with the ‘cheat’ and associated short term gain. • Penalties are instantly applied and to everyone, regardless of size, relationship with the government, or nationality. Critics of such policies might argue that this would penalise ‘honest’ fishing fleets that try to fish responsibly as shark by-catch is inevitable. The answer is that it would not for the following reasons. Firstly the penalty is not applied for catching a shark (accidentally) but for keeping shark products (such as the fins) for sale. Secondly the stated by-catch of sharks by the long line fishing consortium is small (‘We are not interested in catching sharks as tuna is our main industry’) so any loss of income from the sale of accidental by-catch is also correspondingly small. Finally, if sharks are not their intended catch, then using fishing equipment and practices that minimises the shark by-catch actually is better and more effective for the fishing industry. In summary, whilst the intention of the fishing industry lobby to oppose a total shark sanctuary throughout Fiji’s waters but instead suggest localised sanctuaries, seems reasonable, the well established scientific evidence is that this will not work. The research that has demonstrated this is in the study of a game called the ‘Prisoners Dilemma’. Overfishing in other industries around the world show that this research is valid in the ‘real world’ even when the science and consequences of overfishing is known by all stakeholders. The current solution to avoid a Tragedy of the Commons’ where both the eco-system and consequently the fishing industry collapses, is a total ban on all fishing of sharks and any sale of shark products regardless of whether they are accidentally fished or not. Axelrod, R. (1984) The evolution of cooperation, Basic Books, New York. Kollock, P. (1998) Social dilemmas: The anatomy of cooperation. Annual Review of Sociology. 24, 183-214. Dr. Robin Taylor obtained a BSc in zoology from Dundee University and then a PhD in psychology from Edinburgh university. 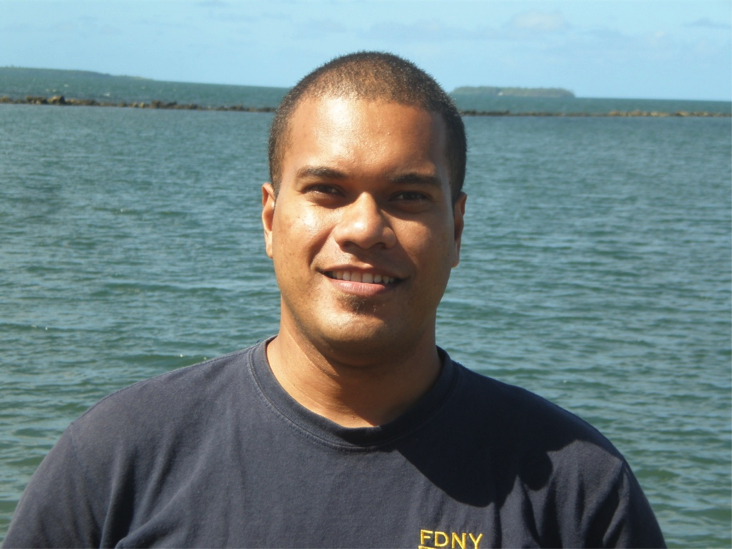 He lives and works in the Fiji Islands with his wife, two daughters, four dogs and two cats. For more than one hundred years, we’ve been aware of the importance of apex predators – animals without natural predators – to the order of the world around us. When it comes to the food chain, they are tops. On land, apex predators include species such as lions, tigers, and bears (oh my!). In the ocean, the ultimate predators are sharks. Aldo Leopold, one of the founders of the environmental movement in the United States, linked the existence of predators and prey by depicting the relationship between wolves, erosion, and deforestation. In an essay called “Thinking Like a Mountain,” Leopold recalls how in his youth, the conventional thinking was that fewer wolves meant more deer. However, without wolves, there was nothing left to keep the deer populations in check. The populations of deer exploded and overgrazed bark and leaves growing on trees, killing the trees. When the trees died, there was nothing to hold the soil in place, and so the mountain eroded into the rivers. As with the wolves, we are witnessing a similar effect in the oceans, as shark populations decline. Sharks may reign in the ocean, but they are not the top predators on the planet; humans are. Each year up to 73 million sharks are caught and killed for their fins, which are used as the namesake ingredient in shark fin soup. Humans also use their livers for oil, their skins for leather, and their teeth for jewelry and souvenirs. Sharks are also caught as bycatch (non-targeted catch), and frequently die when caught in nets or on lines, or after they are thrown back into the water. Through these largely unrestricted fisheries, many shark species have become threatened with extinction. The International Union for the Conservation of Nature has determined that a third of all shark species are threatened or near threatened with extinction. And while fish populations can rebound with proper management, extinction is forever. A case-in-point example: the Pew Environment Group and Jim Toomey, creator of Sherman’s Lagoon, illustrate the apex predator-prey relationship in a new Youtube video posted last week for World Ocean’s Day. Simply put, in the ocean, there are small fish, big fish, and apex predators. Apex predators, such as sharks, eat the big fish, which in turn eat the small fish. Small fish feed upon algae. When apex predators are taken out of that equation, the big fish overwhelm the small fish. With the small fish gone, there is nothing to keep the algae in check. Algae then overtake corals, killing coral reefs. So, you see, sharks are key to keeping our oceans alive and well. Sitting at the very top of the food chain, you and I have a role to play in ensuring that balance is maintained in our marine ecosystems. Right now, we are less than a year out from the 16th meeting of CITES, the Convention on International Trade in Endangered Species of Flora and Fauna, during which delegates from 175 nations will vote to create (or to not create) conservation measures for a number of shark species. 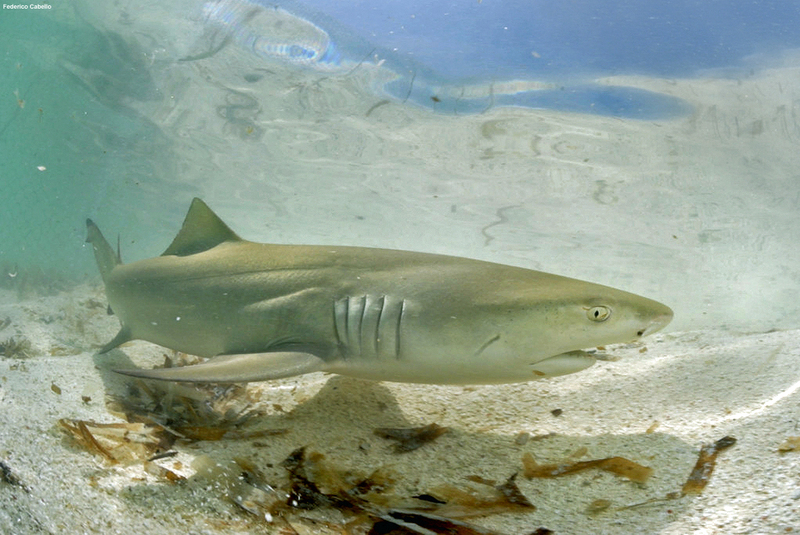 Obviously, this offers an important opportunity to institute broad, sweeping policies to protect sharks and ecosystems, and to ensure that solid management plans are in place for every member party. On a more localized level, we have seen nations, states, territories, and even a region jump on board with creating shark sanctuaries. We’ve discussed on the Shark Defenders blog before how sanctuaries are the gold standard of shark conservation measures, and this is an important point. Prohibiting commercial shark fishing and catch in protected areas – and, in the instance of recent sanctuaries, the possession, sale, and trade of shark products – is like the abstinence message of the sea: it’s the only 100% fail-safe method of preventing unwanted species decline and ecosystem destruction. Creating sanctuaries, ending commercial overfishing, establishing science-based fisheries management plans: These are the ways in which humans can work to protect sharks. It is our onus to do what we can, as the “ultimate” apex predators, to keep our oceans healthy. This is the first and potentially the biggest step that we can all pitch in and take. On Friday, June 22, and Saturday, June 23, the Pew Environment Group will host public screenings of “Sanctuary: The Last Stand for Sharks,” a new documentary that portrays the underwater world of sharks and the global threats they face. This hour long film, directed and produced by John Weller and Shawn Heinrichs, highlights the important steps needed to protect sharks in Federated States of Micronesia waters and the growing movement in the Pacific to prevent extinction and save these threatened species. The film also portrays the most recent protections and depicts the global threats faced by sharks. Friday, June 22, Hopwood Junior High School, Saipan, 7 p.m.
Saturday, June 23, American Memorial National Park, Saipan, 7 p.m.
My name is Alyssa Sablan, and I’m so excited to have the chance to blog for Shark Defenders, moreover to help with some of their social media and online outreach. I really love social media (but obviously not as much as I love sharks). As a Saipan native (the largest island within the Commonwealth of the Northern Mariana Islands), I’ve grown up around the ocean and around sharks. I earned my PADI open water dive certification and have taken every chance I’ve had since then to go diving (I was lucky enough to go diving with Caribbean reef sharks during a trip to The Bahamas last year). Sharks have always played an important role in my life. However, as I’ve grown older, I’ve noticed how shark populations have declined. Sharks used to be everywhere; now during a dive, I’m lucky if I see one. It makes me sad, but motivated because I believe I can make a difference. This is why I’m proud to be interning for Shark Defenders. 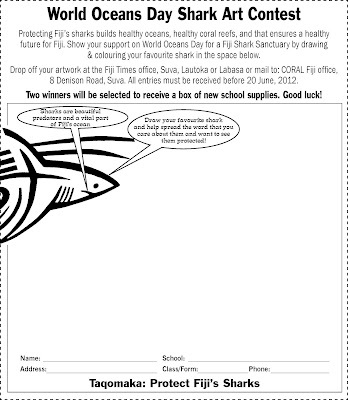 This is giving me a chance to carry on supporting sharks. I loved having the chance to participate in Micronesia Shark Defenders, and I’m so proud of my Commonwealth for passing a bill that banned the sale, possession, and trade of shark fins. I’m looking forward to putting my knowledge of technology and shark conservation to work! It’s important to prevent sharks from going extinct. Call it a generational thing, but I see the value in social media. You’re looking at the new administrator of our Tumblr account, as well as our new Pinterest account. You are on at least one of these, right? If you are – or even if you aren’t – you should check out our pages. I’ve been posting pictures, petitions, and general news items, and I’ll try to keep you updated on what’s going on in the shark world. I hope it’s a good resource for you. Basically, I’m trying to create a “one-stop shop” for all your shark news and information needs, updated daily. Staying in touch with us is a great way to stay updated and to be a Shark Defender. Give our sites a look, and don’t forget to “like” or “follow” us! And, feel free to pass along cool articles or pictures that you think would be good to feature on the page! #FinSanity @SharkDefenders, and, of course, most importantly, #AJRocks (just kidding). 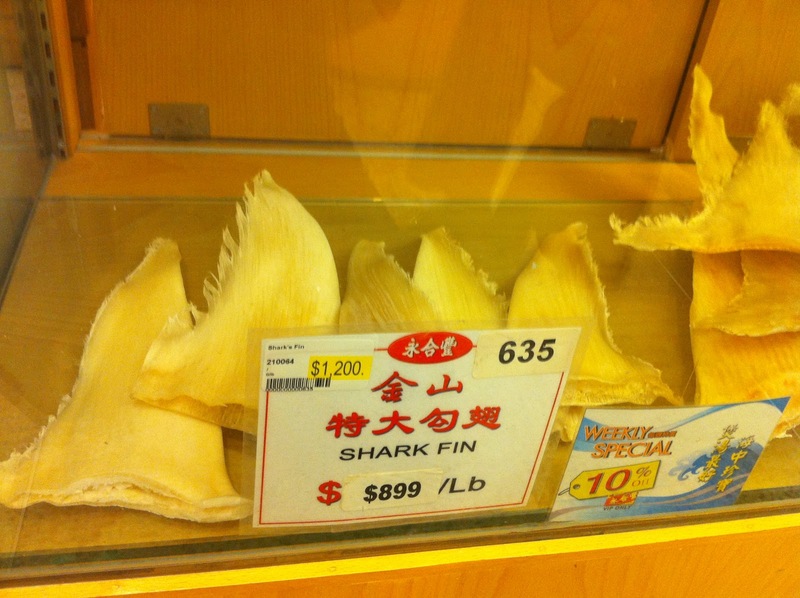 How expensive do shark fins get? These sharks were for sale in Los Angeles a few months ago for US$1,200/lb (US$2,640/kg). Does anyone have any evidence of them selling for more? If so, please email to info@sharkdefenders.com. One year after President Porfirio Lobo Sosa created a permanent shark sanctuary in Honduran waters, he joined the country’s top law enforcement officials today to watch the burning of hundreds of illegal shark fins. 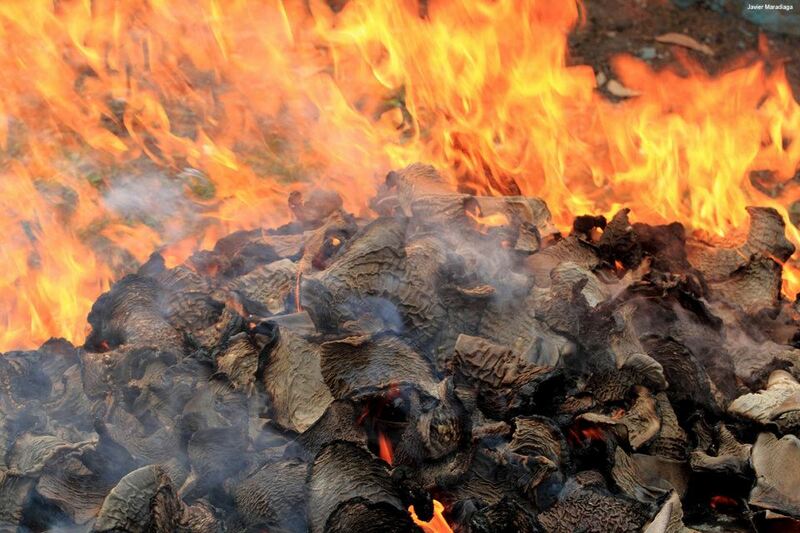 These confiscated fins, worth up to $300 per pound ($700 per kg) in the global marketplace, were destroyed as part of ongoing efforts by authorities to enforce shark protections in Honduras. Shark Defenders offers congrats and thanks to the leaders and people of Honduras for taking such strong measures to protect our sharks.